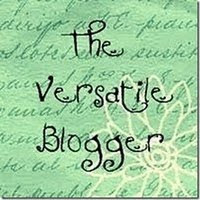 I am so pleased that I have won the Versatile Blogger award, I never win anything so it's a great honour. I am feeling a little embarrassed right now as Helen awarded this to me quite a while ago. I did draft my post but I had a flare and forgot all about it, though that's a poor excuse. I'm really sorry Helen as I was so pleased you thought of me. Thank you Martha when I received your award you reminded me of my draft post so I have added links to you both. Of course there are conditions to the award so I have done my best to follow these. 1. Make a post linking back to the person who gave you the award. 2. Share seven random things about yourself. 3. Award seven recently discovered bloggers with this award and contact them to let them know they have won. So a big thanks goes to Helen at Raindrops and Roses and Martha at After Hours for my award. Here are 7 random things that you may or may not know about me. I love my coffee and drink far too much but I can't stand tea so I'll stick to coffee. I'm a hoarder I'm always collecting rubbish because it might come in useful one day. I do love to recycle/upcycle though and can usually think of how to turn something old into something new and pretty. I'm a loner and love nothing better than being on my own crafting. I have a terrible memory which has got a lot worse with the fibro, well I hope that's my excuse and I'm sticking with it. I have severe hearing loss though as I can talk ok many people don't realise I can't actually hear them until I tell them. I love working with papier mache it's such a versatile medium and I can lose myself for hours working on a sculpture. This was hard as I have found some really great blogs since I started blogging. Here are 7 of my favs. Ali's Craft Studio This is a great blog Ali has a real way with words and can talk about anything even glorious mud. Beautiful Things by Claire I'm always amazed at how much Claire manages to make every week and all are really beautiful. Goblin Dreams A great blog, I do love the steampunk jewellery it's fantastic. 1st Unique Gifts Wendy does a fantastic blog and helped me a lot when I first started. Ballderdash and Bunting Becky always makes great stuff and her cakes are too good to eat. Dorset Girl A great new blog with some gorgeous wooden letters and shapes. With U In Mind Kat's crafts are gorgeous and she has a talent for being able to make almost anything. Love your *confessions*! Especially number 2 - am a bit of a hoarder myself, and I have to do it in secret cos my hubby throws stuff out when I'm not looking!